The REALTORS Care® Blanket Drive runs from Tuesday, November 14 to Tuesday, November 21. Our network of REALTORS® is gearing up for another productive year of collecting warm clothes and blankets. Donations can be dropped at our office from Tuesday, November 14 to Tuesday, November 21. A full list of drop-off locations can be found here. 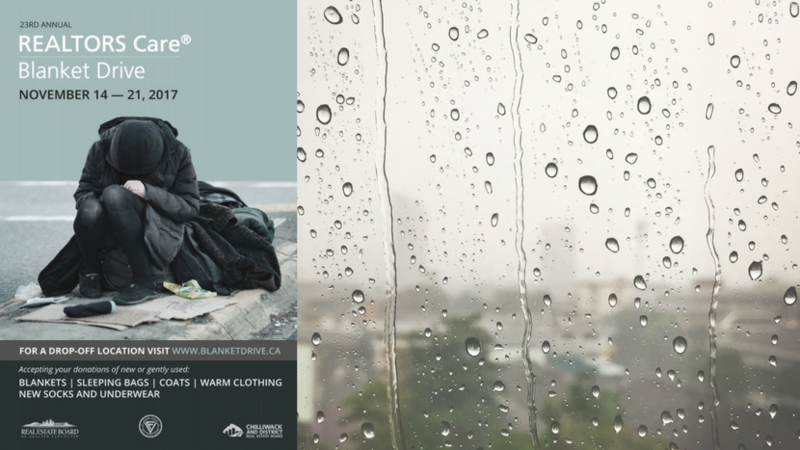 We put out an appeal to our fellow colleagues for warm blankets and coats and collected enough donations to help 3,000 of Vancouver’s homeless in the downtown core. This single act of kindness has blossomed into the longest continual Blanket Drive in the Lower Mainland with more than 300,000 disadvantaged people being helped. Some Facts: More than 30 charities receive our donations each year and 100+ Real Estate offices act as drop off depots. The REALTORS Care® Blanket Drive is a partnership between the REALTORS® of the Real Estate Board of Greater Vancouver, the Fraser Valley Real Estate Board, and the Chilliwack and District Real Estate Board and their communities.